From gray whales giving birth in the lagoons of Baja California to sea otters nestled in kelp beds off California to killer whales living around Vancouver Island—this spectacular stretch of the Pacific Coast boasts one of the most abundant populations of sea mammals on earth. This handy interpretive field guide describes the 45 whales, dolphins, seals, and otters that are resident in, migrate through, or forage from Baja in Mexico to British Columbia in Canada. The guide’s rich species accounts provide details on identification, natural history, distribution, and conservation. They also tell where and how these fascinating animals can best be viewed. 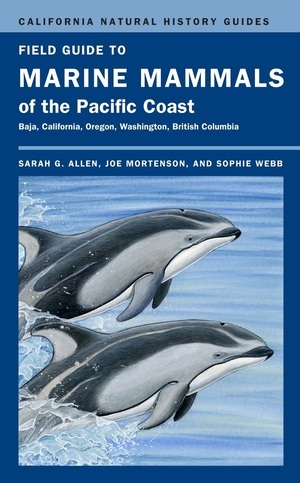 Introductory chapters give general information on the ecology, evolution, and taxonomy of marine mammals; on the Pacific Coast’s unique environment; and on the relationship between marine mammals and humans from native cultures to today. Featuring many color illustrations, photographs, drawings, and maps, this up-to-date guide illuminates a fascinating group of animals and reveals much about their mysterious lives in the ocean.